As some of you know, Raul and the team at Alpaca have been a little frustrated with our listing on TripAdvisor. For some reason, they will not remove the DAY TOURS from our name on the website, even though everyone knows that Alpaca is one of the leaders in treks to Machu Picchu and does much more than just DAY TOURS. We have tried to contact TripAdvisor by phone and email to address this issue and a few others that we have had, but have received little to no response from them. 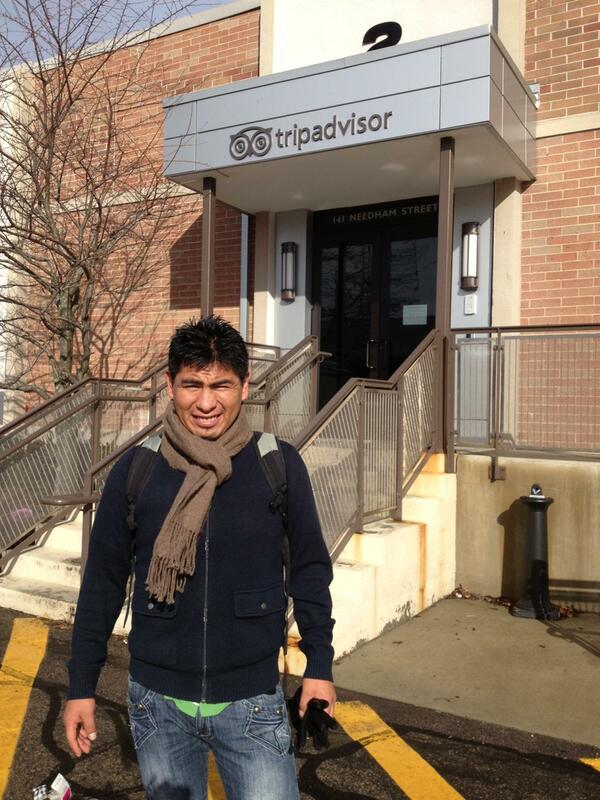 Well Raul decided to use his time off, since the Inca Trail is closing down for February for maintenance, to visit friends in the USA and was in the Boston area and decided to do a trek of his own…to TRIPADVISOR. It ended up being a beautiful day in Boston, even though it was mid January, but unfortunately that didn’t help our cause – since they had a total blackout in the office and almost everyone had gone home in the morning. We were lucky to talk to a few of the workers who explained we were their only visitors with listing questions (how funny) and that there was nothing they personally could do. But they did remind us how important it was to encourage our hikers to write about their experiences while hiking with Alpaca. We are also fighting a competitor in Cusco that keeps publishing terrible reviews for us smaller companies that are rated highly. TripAdvisor is usually good about removing these reviews – that are always the same and always 100% not true – but it does take them some time to do the research and determine its false and in the meantime we drop from number 1 or 2 – to 10 or 15. With your review we can be back on the top. Thanks again for everyone who chooses to trek with Alpaca. We always strive to create amazing vacations for everyone and we hope you loved your experience with us. Perhaps we can all trek together in the future.